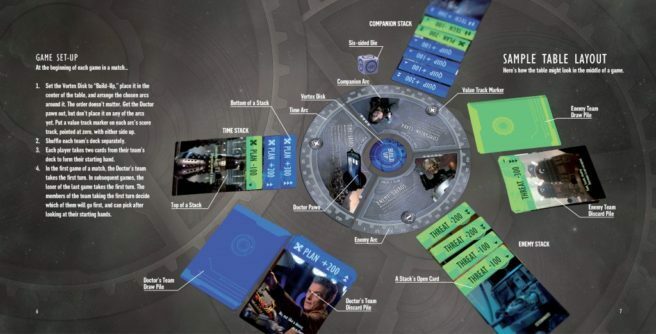 My latest game design, Doctor Who Time Clash, came out in December. I wanted to write here—briefly, because time!—about how I approached the challenge of adapting the Doctor Who source material into a card game. Two sides. Our protagonist Doctor is always opposed by an Enemy. Great news! Games thrive on conflict between players. More than two players means more opportunities to play (and so, better sales) but rather than shoehorn multi-way competition into the world where it doesn’t make sense, in Time Clash, players team up, with up to two Enemy players opposing up to two Doctor players. Myriad settings and villains. Hundreds upon hundreds of episodes of Doctor Who—a show about literally traveling through time and space— present wildly varying historical, futuristic, and totally fabricated settings. Exception-based gameplay (think of CCGs, where each card has some particular power that’s an exception or addition to the general rule of play) seemed like the perfect way to deploy such diverse background material in a game without making the general rules of play totally unwieldy. Companions. With few exceptions, the Doctor is accompanied by one or more companions. Companions and settings both became exceptions-based elements expressed as arcs. Three arcs combine in any given game to form a unique battleground, with the added bonus that a changing landscape of different challenges (arcs can be swapped in and out independently) promotes repeat play. Varying strengths and tactics. Canonical Doctor Who enemies make plans that advance implacably—plans that if not stopped, will prevail. Think of massed ranks of Cybermen on the march. Conversely, the Doctor tends to flail around making clever observations until he hits on a harebrained plan to save the day. So the final key element of the adaptation was to make each side’s deck, and method of winning, different. The Enemy team deploys Threats, Plans, and Tech, while the Doctor relies on Plans, Tech, and Quips. The Enemy wins by bringing the balance of scores into their favor, while the Doctor wins by throwing a game’s worth of card plays behind one high-stakes, make-it-or-break-it roll of a die. 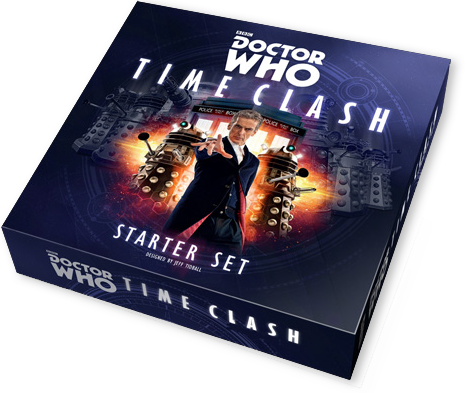 Doctor Who Time Clash is available and in stock around the world right now. Try your friendly local game store first; their knowledgable staff and space to play games make your local community better, and they could use your support. Time Clash‘s first expansion, Against the Cybermen, is in the works. You can download the Time Clash rulebook from the Cubicle 7 website. And if you’ve already played, an honest rating on the Time Clash page at BoardGameGeek is always helpful.